When enjoying your favorite sparkling wine, what type of glass do you reach for? Traditionally, one would choose from a flute or a coupe, allegedly an ode of sorts to Marie Antoinette. While it has been a discussion for a while in the wine community, it has become more of a mainstream discussion of late. Kate Youde recently had a piece in Financial Times covering the science behind and the history of Champagne glasses entitled, “How the champagne wine glass is killing the flute.” Last week, Maggie Henriquez, CEO of Krug, was quoted in The Drinks Business as saying that drinking Champagne out of flutes is comparable to going to a concert with ear plugs. Now, at my advanced age, I have been known to stick some tissue in my ears on the rare occasion I stay awake long enough to go to a loud concert. And I even like to utilize my flutes. But when it comes to analyzing a sparkling wine, when I want to fully enjoy the bouquet, I go for a wider rim glass. Why? The coupe does not allow for swirling and bubbles dissipate quickly. The flute’s shape does a great job of maintaining effervescence. But maybe too well to allow one to pick up on nuances and notes in order to fully experience the wine. I recently enjoyed a sample of sparkling wine from Sussex, just over the English Channel from Champagne. 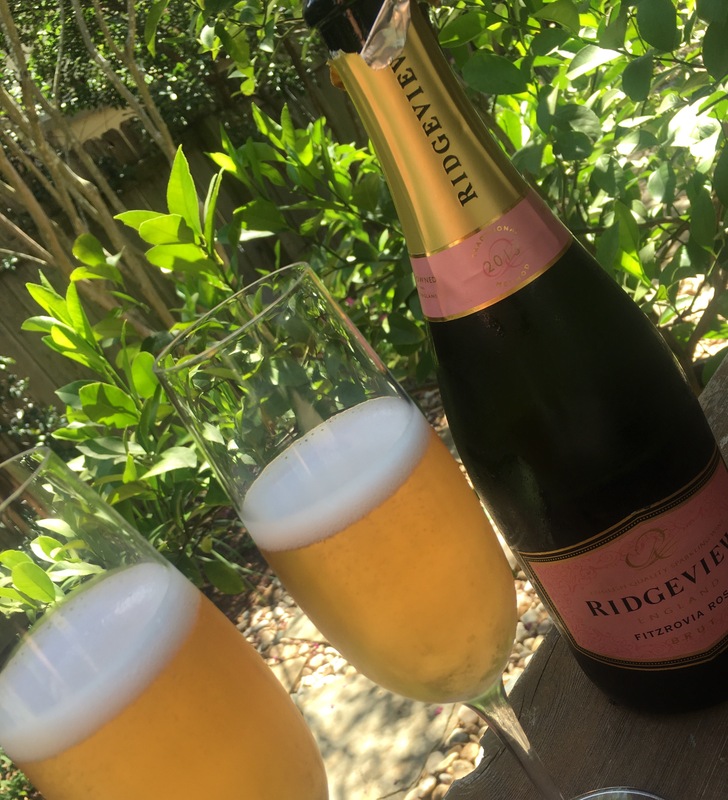 The 2013 Ridgeview Fitzrovia Rosé. The wine is composed of 80% Chardonnay, 17% Pinot Noir, 3% Pinot Meunier. A rich salmon hue, the wine starts with an abundance of red fruit, raspberry, macerated strawberry. The next note I picked up on was one of citrus. My first thought was grapefruit rind, but switched to Bergamot. Perhaps a subliminal nod to Earl Grey tea. This wine is English, after all. It finishes with shortbread biscuits. This wine is delicious. Even my husband who does not love sparkling wine (what?!?) really enjoyed this wine. 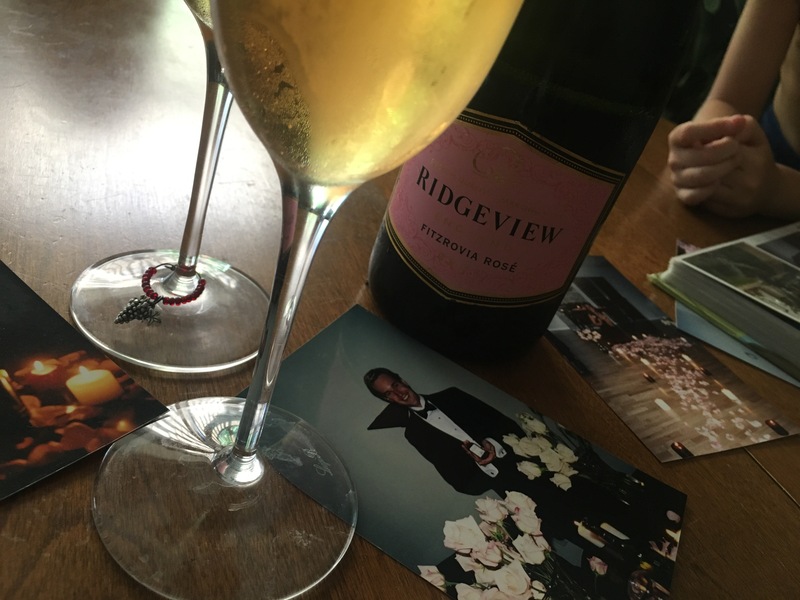 Ridgeview Estate was founded in 1994 by Christine and Michael Roberts. The grapes are grown on limestone and sandstone, just 88 miles north of Champagne. Similar climates and soils yield similar quality grapes. Similar grapes can yield similar quality wines. The Ridgeview Fitzrovia exemplifies this beautifully. We opened the bottle to mark the day we had gotten engaged, thirteen years ago. At our wedding, we toasted with lovely Vera Wang flutes I had chosen for the occasion. We toasted and shared photos and stories with our children. Will the latest trend make me get rid of my flutes? Nope. The legend of the coupe and stories of my family’s relation to the late Queen make me giggle when I drink from the wide rim glass. Not saying au revoir to those either. But for evaluating and showcasing a wine such as this, a wine that expands and enlivens, deserves more. To fully appreciate the bouquet of the wine, I will be investing in some tulips. This wine was received as a media sample. I received no other compensation. Thoughts and opinions are my own. Great read! I still use my flutes, too but not when I’m trying to evaluate a wine. Love the photos!